Water is a dynamic ever changing element which can be used to complement and enhance architecture and landscapes. It can make great additions to any backyard or garden as it creates serenity and a feeling of harmony, as well as creating a brilliant focal point. Nothing compares to a nice alternative for the texture and appearance of carved, natural stones. The sound of falling water, the soft dance of light across a waterfall at night, the irregular surface that breaks up the falling water brings beauty and value to the surroundings. 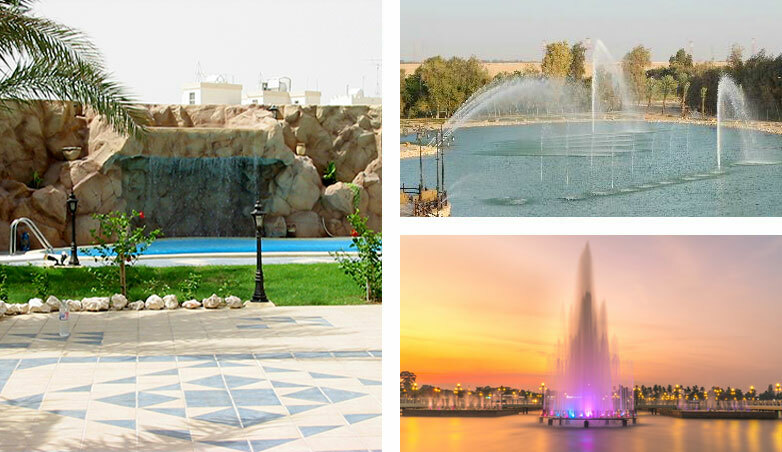 We take pride on the high quality of our different kinds of water features and the sheer variety of designs we are proud to offer. Sun Burst, High & Heavy Cascade, Geneva Jet at 100 ft.